In Rugby there tends to be just one place kicker. This weekend Johnny Sexton will take most of the kicks regardless of the side of the pitch the occur. Looking at Johnny Sexton’s kicks between 5m and 15m from the touchline on either side of the pitch there is a difference in his success rate. From the left hand side of the pitch(the ‘more natural side’ for a right footed kicker) he converts 69% and from the opposite side converts 59%. All other things considered it does seem the side of the pitch matters to Johnny. What about Gaelic Football. Does it matter and if so does it matter the same for free’s as it does from open play? In this example I looked at a sample of 5,000+ shots. I wanted to see if Gaelic Footballers have a natural side, if so what is the size of the effect. Firstly I grouped all shots (from play and placed balls) together and simply looked at the success % for each side. Each side is made up of approx 40 meters leaving 10 meters in the centre, which was ignored here. Again we see a very similar trend here. The effect is there for both Right & Left footers but seems to affect the Righties a lot more. Definitely an effect. I wouldn’t think the effect is that great for Left Footers. 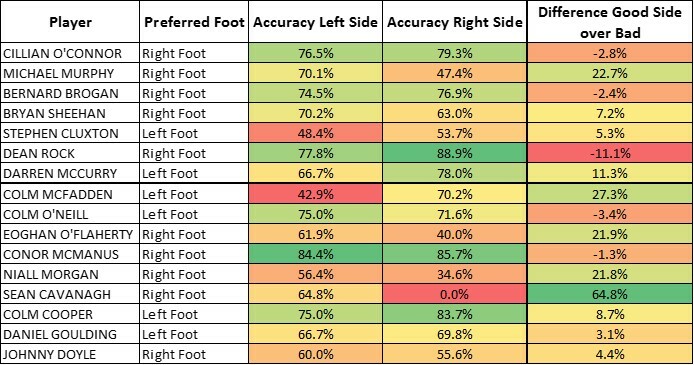 So few Left footed free are attempted from the left hand-side that I would suggest this 34% is because of the low sample size. However there is definitely an effect on the other side of the pitch. We see an 11% swing just accounting for the foot used. I have ignored distance from goal in this example but I simply wanted to see does the side of the pitch and the foot used make a difference. And it does… certainly if you are right footed. 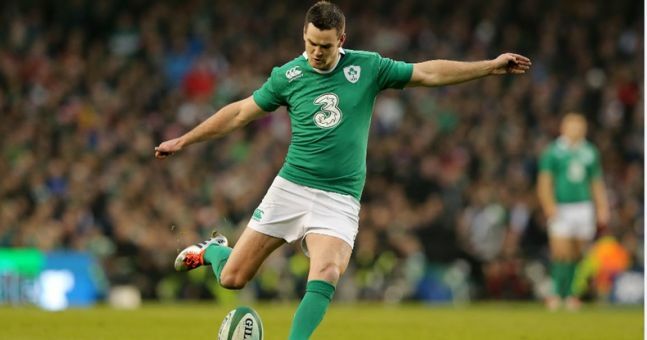 In the rugby example above Johnny kicking from the ‘wrong side’ might still be better than the best left footed kicker in the Ireland team. It’s not simply a matter of saying any left-footer beats a right footer. If someone is good enough and the numbers hold up maybe the side of the pitch doesn’t matter. So let’s take a look at the most regular free-takers in our game over the last 5 years. The below table is the accuracy for any free-taker in my database that has attempted over 50 frees (regardless of the side of the pitch). 11 of the 16 were better on their more natural side. There is definitely something to look at in terms of the Donegal free-takers. Both seem to really struggle on the wrong side but for someone like Cillian O’Connor it seems to make no difference, he is the best free-taker regardless of the side of the pitch the infraction appears. In summary I think there is merit in looking at what side of the pitch and what foot the player likes to lose but don’t lose sight of the individuals. It’s not a one size fits all answer. I also think it was worth noting the distance that each of the free kicks are being taken from. Everyone knows Bryan Sheehan will attempt many fre kicks on either side of the pitch that are beyond the 45m line. If all free kicks were taken within 30 metres for example i imagine your statistics will read very differently 🙂 Overally your analysis can’t really be faulted!